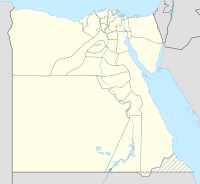 Sidi Haneish Airfield is an abandoned World War II military airfield complex in Egypt, in the western desert, about 235 miles (376 km) west-northwest of Cairo. The airfield, known as Haggag el Qasaba by the German Luftwaffe, was the location of one of the most daring raids during World War II by the British Special Air Service (SAS). On the night of 26 July 1942, SAS Detachment "L", also known as "Stirling's Raiders", attacked the airfield, then under Luftwaffe control. Driving a convoy of 18 American jeeps, the raiders destroyed 18 German aircraft and damaged several other aircraft in a night raid. The attack damaged the Luftwaffe's capability during the German invasion of Egypt and also, by the destruction of many transport aircraft, severely diminished its ability to re-supply German land forces in the field. The airfield was later used by the United States Army Air Force Ninth Air Force during the Eastern Desert Campaign by the British Eighth Army, which the 57th Fighter Group, flew P-40 Warhawks from on 8–12 November 1942. ^ Mortimer, Gavin (2015-04-21). Stirling’s Desert Triumph: The SAS Egyptian Airfield Raids 1942. Peter Dennis, Johnny Shumate, Alan Gilliland (First ed.). Osprey Publishing. ISBN 9781472807632. Vick, Alan (1995). Snakes in the Eagle's Nest: A History of Ground Attacks on Air Bases. Rand. p. 53. ISBN 978-0-8330-1629-4. Lists several airfields in the area.